Now I'm thinking of something with more spin, I follow the same path as a surfboard. What do you think about this position of fins? Last edited by asier esnal on Thu Nov 08, 2018 4:31 pm, edited 1 time in total. general rule is on wide tails you would want your fins placed closed to the rail. Has someone mounted fins like that? How did it work? As a trailer, I might just go with a single small fin instead of two. Maybe even a knubster type. I've been looking at bodyboard photos, for my taste the most successful version in 2 or 4 fins. I suggest you study McKee's Quatro Formula. It's not just about fin placement, but individual fin template as well. He lays it all out. for the position of the keels I followed the tables that mckee provides, adapted a bit to the paipo. 1/8" front and 0" rear favors speed over turning. 1/4" front and 1/8" rear favors turning over speed. Larger fin rear and smaller fin front more pivot-y turns. Nomas, within the specs you mention above is there much comment on fin (skeg) plan shape? Short answer is yes, but McKee goes into great detail regarding the various FCS templates and How they function in quad set ups. 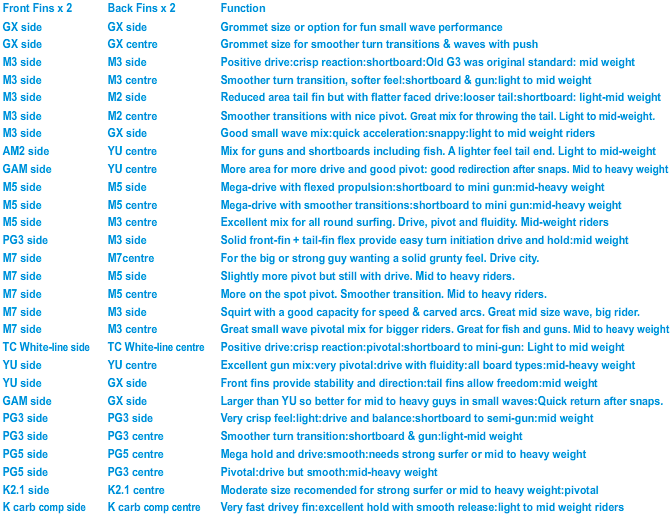 There's almost too much information on fin template combinations. McKee uses the FCS fin nomenclature to help identify potential quad fin sets. Its a little tricky at first, but once you realize x3 fins are small, x5 fins are medium and x7 fins are large it's a bit easier to understand. So, M5 fins and G5 fins are the same template. in different material composition. GX or GS fins are longboard side bites. He also discusses fins with different foils, e.g asymmetric flat, 80/20, 60/40, and when to use symmetric 50/50 center fins. Many third party fin makers (True Ames, Shaper Australia to name two) use some variation of the FCS nomenclature to identify their "2-tab" fin-base fins, so the rider is not restricted to just FCS branded fins. His Quadra Formula is pretty specific, although he has tables for shortboards, longboards and kneeboards. Because unlike Futures, which require a shallow 1/2" rear fin box to accommodate Future quad fin sets instead of the Future standard 3/4" box, FCS and other "2-tab" fins can be taken from any tri-fin set or LB side bite set, new or used. (just stay away from FCS II) Additionally, FCS Fusion fin boxes can be ordered in 0-deg, 5-deg and 9-deg cant setting. All in all, plenty of ways to customize and dial-in your ride. Today in waves that close with force I have had a very strong blow against the horned paipo, I've done enough damage, I'm fine. asier esnal wrote: Today in waves that close with force I have had a very strong blow against the horned paipo, I've done enough damage, I'm fine. Yes, if what you are saying means something like powerful shore break then hard boards, fins and point tails (horns) can put one at risk. Remember water likes to stick to a rounded surface and break from a hard edge so you dont want hard channels. My finless design has enough hold for a hard bottom turn on a 10ft wave you are welcome to the CNC cut file if you would like to look at it. Now I have to laminate fiberglass. PE polyethylene is compatible with polyester? You guessed correctly! The deck is the material on a bodyboard that you lie on. The usual configuration for deck material is 8lb (density per inch) PE (polyethylene). PE decks are soft and flexible just like PE Cores but, similarly, after time they’re unable to find their original shape. Indentations and creases in areas under pressure also develop quickly in PE decks. Manufacturers are looking at ways to stop this happening but some riders prefer their boards a little warn in, with elbow divots through continued use and mellow deck creases. The alternative to a PE deck is known as crosslink, a thinner 6lb cell structure that absorbs less water whilst being more durable but it tends to be far stiffer. This is often used on boards in the £100 and under price bracket as it’s slightly cheaper to produce. If you purchase one of these numbers be aware it requires more wax for traction, this is due to its vinyl feel and touch. The type of deck you will get really comes down to budget. It will be interesting to hear your experience. I rode this board a few times. It was fun on fuller, down the line waves, but it didn't hold an edge in a tube as well as my current board. The board is a lot thicker than it looks - about 3". bgreen wrote: It will be interesting to hear your experience. I rode this board a few times. for this in the design I think about the shape of the channels that do the grip function. There have been several evolutions in the board since the first description (e.g., the thread title still says quad fins). Please provided updated specifications including nose and tail rockers. I'm not a shaper, although here's my theory: the rails are very tick and rounded, so it makes it difficult to bite the wave face. Also, the board is wide but not that long, so you don't have much rail surface to bite the wave. Regarding the chop, the tickness and the buyancy don't help either. A thin, not buoyant board works better in the chop, cause it just pierces it instead of rebounding on it, resulting in more water projections in your face but a less bumpy ride. The way I see it, the typical prone board outline coupled with a relatively flat bottom is a very efficient planing surface. Volume (typically derived through adjustments in thickness) needs to be modulated to match wave size and power, and rider weight. Bottom contours, fins, deck contours, rail shape, etc should not be considered until the basic outline and volume has been determined. I always go back to the tried and true foam body board as the baseline. They are readily available. Ride one in the waves conditions you prefer, and decide what you like and/or don't like about the ride. Then, design a shape that has the features you believe will enhance the ride. Just don't make too many changes at once. My G5 design didn't just appear out of thin air. It was the end result of five major design changes, with multiple design "tweaks" in between, over the course of 10yrs. It requires patience and time in the water to develop a functional surfcraft. Take your time, understand how surfcraft function, always "know" why a design feature works, or strive to understand why it doesn't, be methodical in your approach (Larry Goddard-esque). I'm a bit lost with all the ideas. I think Nomastomas has some sound advice. What is the design that you think works best, so far?